Homelessness continues to be pervasive problem in Cuyahoga County. Family homelessness is on the rise. The women’s shelter is housing forty more women than they have beds. The men’s shelter is regularly operating an overflow. Your support for this concert would help us improve the conditions in the shelter and house people in our community. 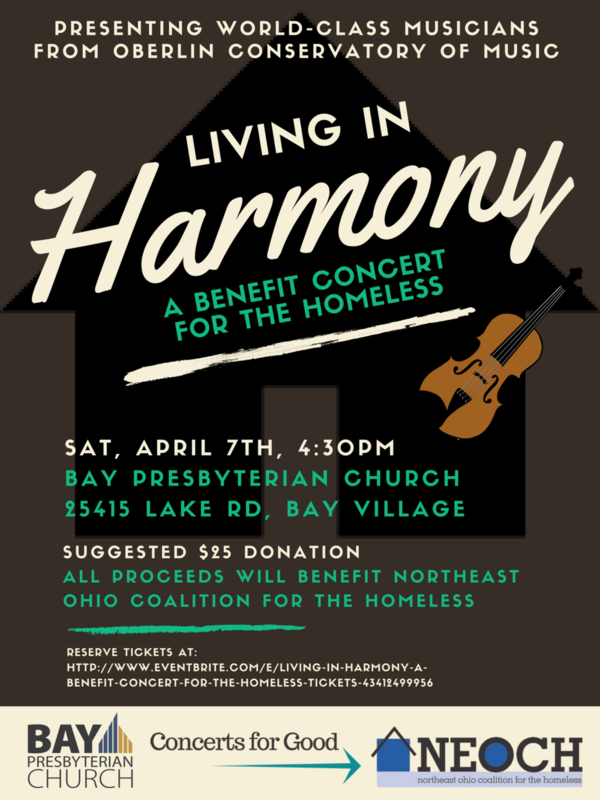 Join Concerts for Good and NEOCH for an afternoon of music performed by classical and jazz musicians from the world-class Oberlin Conservatory of Music to help end homelessness The concert will take place at 4:30pm at Bay Presbyterian Church in Bay Village, Ohio and will bring to light the issue of homelessness in Cuyahoga County. Donations are accepted on Eventbrite as well as at the event. All proceeds will benefit Northeast Ohio Coalition for the Homeless. Appetizers will be served. All ages are welcome, and parking is available. For questions or concerns, please contact ckobetit@oberlin.edu. We know that many organizations and companies have a desire to give back to the local community. We hope that you can join us in ending homeless through your sponsorship. • $500 - Gold Medal: Your organization would be named prominently on the invitations, press releases, full page ad in the event program, and advertising on the event flyer and NEOCH’s website (including a link to your organization’s website). • $200 - Silver Medal: your organization name and logo would be listed on the press materials, a ¼ page-sized ad in the event program, and NEOCH’s website (with a link to your website). • $100 - Bronze Medal: Your organization’s name would be listed on NEOCH’s website and would receive a business card-sized page ad in the event program. • If you cannot give now but will advertise the event within your network, your organization will be listed as a sponsor in the event program. If your organization would like to participate in this special event as a sponsor, please fill out the below form and donate online through our website.